After a four hour flight, we landed at Hong Kong airport and got the very efficient airport train into the centre where we checked into our hotel. The first port of call was Sam's tailor, as we wanted to get a suit made for Neil for the wedding. 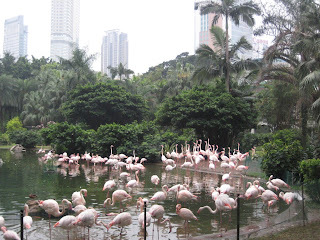 We had the details of how to get there and crossed through Kowloon park which our hotel overlooked. It was a very foggy day, but warm and mild and we were struck by the tropical feel to the whole place. The park had beautiful foliage all around with exotic birds singing in the trees and a "flock" of flamingos all preening themselves by a pond! It was quite a surreal experience to see them all there, clucking away, with massive skyscrapers looming up behind them. We managed to find Sam's tailor (while being accosted by several other "tailors" en route, all with cheap suites or watched to flog) without too much problem, and they took all of Neil's measurements, asking us to return the next day at noon for his first fitting. First time on a wheel!